The i-oniq is an electric sports hatchback with a range-extending petrol engine and has been built to showcase Hyundai’s new technology and design thinking. The Hyundai i-oniq has a 1.0-litre, 3-cylinder petrol engine mated via a generator to a lithium ion electric motor which produces 108bhp. In electric-only mode, the i-oniq has a range of 120km (about 75 miles), while with assistance from the petrol engine it can travel up to 700km (about 435 miles). The i-oniq’s CO2 emissions are a claimed 45g/km. The 4.4-metre-long i-oniq evolves Hyundai’s latest fluidic sculpture form language, and includes a 'penthouse roof' design and LED headlights. The concept seats four and has a driver-oriented cabin with a high-tech interface and controls. Passengers benefit from a lounge-style space that features sculpted surfaces inspired by musical instruments. 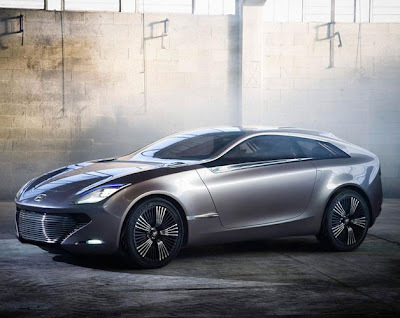 The i-oniq concept was designed and developed at Hyundai’s European R&D centre in Rüsselsheim, Germany.